In Edible Enlightenment Part 1, I delivered to you my story of Pho, a Vietnamese soup, and its flavor profile, history, and how with the addition of the traditional accoutrements you can season to your palate. In today’s Edible Enlightenment Part 2, I will review a selection of local Pho restaurants. These Pho restaurants are on the west side of town with one exception on York Road. I apologize to any Pho restaurant I might have overlooked – please leave a comment if I missed any other locations. I’ve been in a number of Pho restaurants and I must say that Baltimore Pho is the fine dining of Pho and Vietnamese food in the city. Across from the Hollins Street Market, in the old Mencken’s Cultured Pearl location, Baltimore Pho is carving a niche for itself as upscale Vietnamese dining. It embraces Baltimore’s seafood connection - hence the name Baltimore Pho. It was mid May when I tried Baltimore Pho Restaurant and Bar. My dinner reservations were early enough to enjoy their happy hour drink specials and Vietnamese noshes at the exposed brick bar. I had a yummy Lychee Mojito for $6.00 – a great combination of the sweet, tart flavors that I love. A good deal of thought was put into the look and feel of the place: bamboo mats, upscale red chopsticks, and logo-emblazoned triangle shaped dishes. 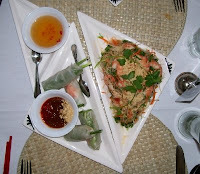 My companion and I kicked off the meal with the Vietnamese Rice Paper Rolls with 2 dipping sauces and Green Papaya Salad. I have been spoiled by my friends’, the Hoangs, rendition of rice paper rolls (they called them summer rolls) which is my gauge for all others. 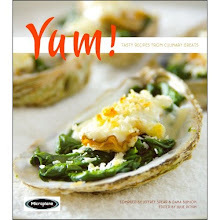 The Hoang’s version was lighter on the fresh herbs. Now down to the nitty-gritty, the Pho. Baltimore Pho has a more American pleasing palate selection of well done beef, rare beef, beef meat ball, combination of meats, Baltimore seafood, and a vegetarian version with tofu. 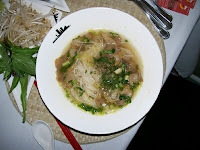 The flank tendon or tripe renditions available at the more traditional Pho restaurants were not available. I got the well-done beef version, the broth was subtle and a tinge sweeter than I’m used to but it was a tasty bowl of soup. I was surprised to see culantro (no not cilantro) on the condiment plate. The pricing is significantly higher than the traditional Pho restaurants which are usually around $6 a bowl. If memory serves me, Tuesday night is Neighborhood Night at Baltimore Pho, offering a heavy Pho discount. You will need to show your license to prove you live in the neighborhood. One might assume the number one after this restaurant name is implying that it is the best Pho you can consume, does that make Pho #75 in Virginia the seventy fifth. In researching my Pho article I discovered that many of these restaurants add the number of the year that they opened ( i.e. 1975 or 2001). Not as high end as Baltimore Pho, Pho # 1 is still a step above the cafeteria-feel Pho restaurants like An Loi in Columbia. 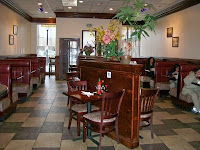 The menu offers a large selection of Vietnamese dishes and fresh fruit drinks. You have a large selection of meats and combination of meats to go in your Pho. The small bowl is sufficient for any grown adult to fill themselves. The broth is bolder and more assertive and it is a flavor I like. They aren’t as fancy with the accoutrements, and each table has assorted hot sauces and hoisin set up like we American’s have ketchup and mustard on the tables. I’ve had other dishes other than the Pho and they were okay, it is truly the Pho that I go back for time-and-again. The few things I can write about An Loi is that it is in an out-of-the-way strip mall that took me forever to find and it is as basic as it comes. I haven’t eaten there in years and I heard owners have changed so I can’t give you a review. I remember the Pho being tasty. Pho Dat Thanh is also in Columbia, more upscale in ambience, a tad above Pho#1 but not as fancy as Baltimore Pho. I have eaten there a number of times and find the soups to be where they shine. Try the Pho and I highly recommend the duck noodle soup. I have discovered some new places while researching this story and will make sojourns to taste their Pho and will update you periodically. I’m going to list as many of the Pho restaurants that I can find, if I have missed one let me know. May I suggest you call the restaurants for their days of operation and hours. Pho #1 is my favorite. they have a good selection of vietnamese dishes, other than their pho list, that i can choose from. Pho Dat Thanh is ok. i've only been twice and i can't remember the pho. it's too far for me to drive to, and there are better restaurants in Columbia to hit. Baltimore Pho is my least favorite pho place and you hit right on the head by saying it'll be more to American tastes. it's rather bland to me but i will continue to support this place because it is local to my neighborhood and there is room for improvement.